Brian Kilmeade: One of the few people not surprised, and not looking forward to, but not surprised by radical Islam rearing its ugly head for the worst mass shooting in American history is Pete Hoekstra. Congressman, welcome back. Pete Hoekstra: Hey, thank you, always good to be with you, Brian. Kilmeade: You know about this threat. You knew about soft targets. You knew they were coming and are here. Hoekstra: Oh we've known this. You know, actually we've known this for years. America has known this for years. Obama has known this for years. All you need to do is take a look at our history domestically. You need to take a look at what's happening in Europe, and it's kind of like, all right, it's going to happen here, and guess what Brian, it's going to happen again this summer, and it's going to happen again in Europe this summer. This is not an isolated event. This is a continuing saga of terrorism against the West. They want to destroy America. They want to destroy everything we stand for, and they are not going to give up until we wipe them out. Clip #1 – President Obama: For a while now, the main contribution of some of my friends on the other side of the aisle have made in the fight against ISIL, is to criticize this administration and me for not using the phrase 'radical Islam.'" "That's the key," they tell us. "We can't beat ISIL unless we call them 'radical Islamists.'" What exactly would using this label accomplish? Kilmeade: Stop it right there. What would it accomplish? Hoekstra: Well I'll tell you, it will accomplish a couple of things. If we started identifying this as radical Islam, that means that this administration would no longer affiliate itself with organizations like the Council on American-Islamic Relations, CAIR, which is an unindicted co-conspirator. Under this administration CAIR and other Muslim front groups have been welcomed into the State Department. They have been welcomed into the White House to discuss policy. CAIR says after every one of these things, after every one of these events they say four things: Number one, "we share in your grief and sympathy." The second thing that they say, "this has nothing to do with religion." The third thing they say, "This is all about America's policy in the Middle East," i.e. throw Israel under the bus, and then the fourth thing that they say, "and the people that are really going to suffer as a consequence of this attack is that Muslim Americans are going to suffer from more Islamaphobia." That's one thing—we would no longer engage those folks. The second thing is if we said that this was radical Islamist, the president would not have engaged with the Muslim Brotherhood in Egypt to overthrow Mubarak. He would not have engaged with Muslim Brotherhood-affiliated and other radical jihadist groups in the Middle East to overthrow Gaddafi, and we would have had Gaddafi in power yet, and we would have Mubarak in power and they would have, as Steve Doocy said eight, nine months ago when I was with you on Fox & Friends show, he said "what Mubarak and Gaddafi did," remember this? "They kept the lid on the garbage can. And Obama and Clinton by getting rid of these folks, by engaging with radical jihadists, radical Islamists, overthrew these folks and the lid has come off the garbage can." That's the president. If the president said those words and engaged and acted on those words, we would have seen different behavior. Kilmeade: I don't think the President wanted to take action in Libya. I think the Senator—excuse me, the Secretary of State, Hilary Clinton, got together with Susan Rice and said "We've got to do this, there's going to be carnage," and then he had no plan afterwards. Now George Bush didn't have the right plan after Saddam was taken out, but at least he had a plan. Adjusted it, the surge worked. There was no plan here. Hoekstra: There was no plan, but there wasn't going to be carnage. All the evidence is clear. That was, again, one of these phony straw men, but the bottom line is we need to take a look at who we allied with. We allied with radical jihadists, and once they got rid of Gaddafi, then they said, "Well now that Gaddafi is gone, now we want to get the rest of the West out, and we're going to get the United States out of here," so that the groups that we allied with were the same groups that eventually killed our ambassador and three other Americans. Clip #2 – President Obama: We now have proposals from the presumptive Republican nominee for President of the United States to bar all Muslims from emmigrating to America. We hear language that singles out immigrants, and suggests entire religious communities are complicit in violence. Where does this stop? Hoekstra: Well, where this stops it's very clear. Donald Trump walked back his statement from a few weeks ago and said, "I'm going to suspend immigration from those countries where terrorism has made a significant presence." He no longer used the term just the Muslim community–those countries. And you know what, that's a pretty reasonable policy especially, you know, the comment that everybody has repeated over and over is Comey saying "We don't have a way to vet those folks coming into the United States," and until we do, we should suspend immigration from those countries that have a significant tendency towards terrorism and where terrorism has reared its ugly head. Kilmeade: I want to talk a little bit about this operation. First off, your take on how it went down and this, the killer's two trips to Saudi Arabia. Hoekstra: Well actually, it was a very rational discussion because he was talking about how he stayed in power and also how the United States could protect himself, but one of the things that he was consistently worried about and warned the United States about was "when my young people leave Libya, and they go to Saudi Arabia, they go there for the Hajj, that is when I worry about them because that is when they are most vulnerable to becoming radicalized." And you need to understand that when American and Europeans go on the Hajj, they may go for the right reasons, but they are going to be targeted by radical jihadist groups to become radicalized and become a cell here in the United States to carry out their radical jihadist activities. Kilmeade: All right, so looking at this case in particular, now I know that you were the former Chairman of the House Intelligence Committee, you had access to a lot more stuff, but you've seen the pattern before. They are now looking at the wife—the wife must of known, might have even driven him there, might have tried to talk him out of it, but you did say "Oh yeah, we used to go to downtown Disney and surveil, heavily surveil"—Disney was able to pick it up, reportedly, and tell local authorities. What is going on that the FBI, who I love these guys, but they get the right guys, they talk to the right guys, but they're not able to stop the right guys. Now, Disney gives them more than a tip. They are so well respected in Orlando–you know what they do for Orlando. What's missing here? Kilmeade: But local, federal, presidential, I mean they're still not connecting. Hoekstra: Well, the question here will be "did they connect?" You know, was there a joint terrorism task force? A tip like this should automatically have made its way to the FBI, to state law enforcement officials, and so do they actually have the tools to go and hold and detain this individual? Did they have enough information? That's going to be the question here. Reporter 1: How many times has the FBI spoken to them? Reporter 1: Did she tell you that she had taken Omar to the Pulse Nightclub? Father: Sir, sir, I don't have any information. Kilmeade: No. He already said it. Kilmeade: He also said his son acted because he didn't like to see gays interact, yet he went to a gay nightclub, this club maybe 20 times, and he had all these gay sites. So he's lying already and he's told everybody that my son is gay. So he's already lied to you. If you're trying to get the information from people–and you've already caught him lying–how much more do you got to take? Hoekstra: Well, the question is how much more do you need to take, but the second question becomes exactly what can you do about lying, about those kinds of activities? Kilmeade: We've got to—so you're saying possibly law enforcement needs more latitude, more room to operate, to detain and question. Hoekstra: It appears, and I think Director Comey has said this a number of times that, you know, you go through the process, but they suspend the investigation because they don't come up with enough information to continue the surveillance, and then you take a look at what's going on in New York City, where they used to have a surveillance program on mosques and what areas that they thought were potentially breeding grounds for radical jihadists, and this mayor and the new police commissioner, I think, have told them to stop. Kilmeade: Yeah, they've told them that it's un-American. Kilmeade: When we come back, Chairman Pete Hoekstra, we'll have a few more moments with him and we'll try to squeeze in some calls. I know we've got a lot from Orlando, and you're the type of guy they need to hear from. So maybe we'll do that. Thanks so much Congressman for being here, back in a moment—by the way the phone number 1-866-408-7669. Kilmeade: Hey, we're back everybody with Congressman Pete Hoekstra who is–now he's got another job. He is in the private sector now. He used to run the House Intelligence Committee and still very much tapped in. He is author of the book "Architects of Disaster" and is the Shillman Senior Fellow at the Investigative Project on Terrorism. Congressman, first off, do you think Donald Trump understands the threat? After all, he has been in business for over 40 years. When you heard his speeches late, on prompter, where he took on the president yesterday, do you like his message? Hoekstra: I do like his message. I believe that Mr. Trump recognizes that this is a threat against America and our values. The bright shining city on the hill. They want to destroy us. They want to establish a caliphate that is governed by Sharia law, and I think Donald Trump recognizes the severity of this threat. 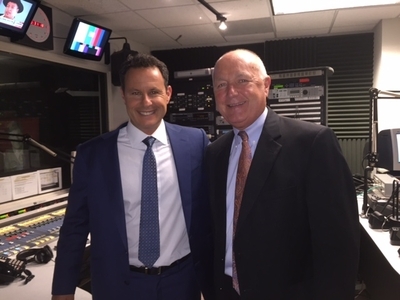 Kilmeade: Here is Mark listening on News 96.5 in Orlando. Mark say hello to Pete Hoekstra. Mark (Caller): Good morning, Congressman, Brian. Kilmeade: What's on your mind? Mark (Caller): Here's the thing. Whether you are Republican, Democrat, liberal or conservative, I think it's fair to say the words have to be said. Enough is enough. This PC crap is a joke. Where I'm at right now is if you look at the history. Look at Obama seven years, since June of 2009. In June of 2009 we had a Tennessee military recruiting station shot up by an Islamic extremist. 11/9 Fort Hood. 9/12 Benghazi. 4/13 Boston bombings. 5/15 ISIS directed gunman shootout in Texas. 7/15 Islamic attack on Navy recruiting station in Tennessee. 12/15 San Bernardino. 6/16, my hometown, my backyard, Orlando. When is enough going to be enough? Regardless what side of the aisle you're on, when is enough going to be enough? And this is a big reason why so many people are supporting Donald Trump right now. Whether you're gay, Hispanic, straight, it doesn't matter. Kilmeade: Right. Because he's got your back because you're an American, and there's a sense that this President doesn't have our back. Hoekstra: Well, that's exactly right and he doesn't have our back, and he doesn't have the back of the world because, Mark, what you've outlined is what's happening in the United States, but you also need to take a look at what's happened in Europe. We now have four failed states in the Middle East and in Africa. It's ugly. Kilmeade: Congressman, there's gun control in France. You can't own a gun in France. Did that stop the Paris attackers twice? Hoekstra: It hasn't stopped the attackers in Paris. It won't stop the attackers here in the United States. It's the ideology. It's the motivation that we need to defeat. Kilmeade: The president came out and said "I won't say radical Islam," well why won't he tell that to President Hollande and Prime Minister Cameron? Because they do say that. Hoekstra: Well the—Europe is moving much quicker. They've lost a whole lot more ground than what we have, but now they're responding. And they are going to do, they're doing things that we would never think about doing here, and if we don't respond quickly to defeat this threat, we're going to be in the same position. Kilmeade: Are we—where is the homegrown threat radicalized online, stand? Should it be minimized or should that be different from the guy that goes over and trains in Syria and comes back? Hoekstra: You go to Syria and you train, and you go to be part of ISIS, your American citizenship should be revoked and you should never be welcomed back into this country. We need to be very aggressive in going and taking these online sites out, and we need to be able to access these sites and see who else is accessing these sites and investigate who they are, and perhaps even make it a crime to visit these on-web—or these websites. Kilmeade: Yeah, well we'll see what happens because so far it hasn't really happened. It's happening gradually, and the problem, too, you know this better than most, is we don't interrogate anybody anymore. We don't find out what is going on. We kill them from above. Hoekstra: We kill them from above and the drone program works but if you're going to get—Hilary mentioned it—you need intelligence. This administration has decimated our intelligence community and capabilities. Kilmeade: Chairman Hoekstra, thanks so much.